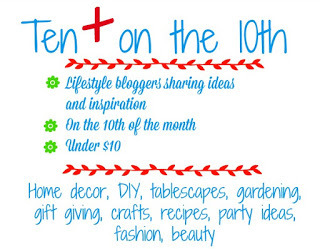 I am joining Ten on the Tenth again to share an Easter basket idea. I spray primed the pots white paint and then "sponged" acrylic paint over the whole pot, white over white for the base, and then 3 different colors on the rim. The faces were painted with very thin brushes (but you could also use a sharpie). These are a cute and inexpensive gift to make for under $10! Imagine a "Santa" face for Christmas!! Oh my gosh what an adorable great idea for Easter! So very clever, and the inclusion of gift tag cocktails are especially great. Very cute, Patti. What a precious gift. Patti, I love this! So cute and what a great gift! I can definitely see this with a Santa face -- I would have to find a sticker or stencil, because I have no drawing skills at all...I mean at all! I screw up when I'm tracing! Hugs! You can never go wrong with tulips. Now if I could somehow replace my brown thumb for a green one, I'd do it! Cute idea. A Cocktail Garden? How clever! Your friends are very lucky to have you, Patti! Patti, your painted pots are adorable!! Thanks for sharing the sponge technique, it really looks great! 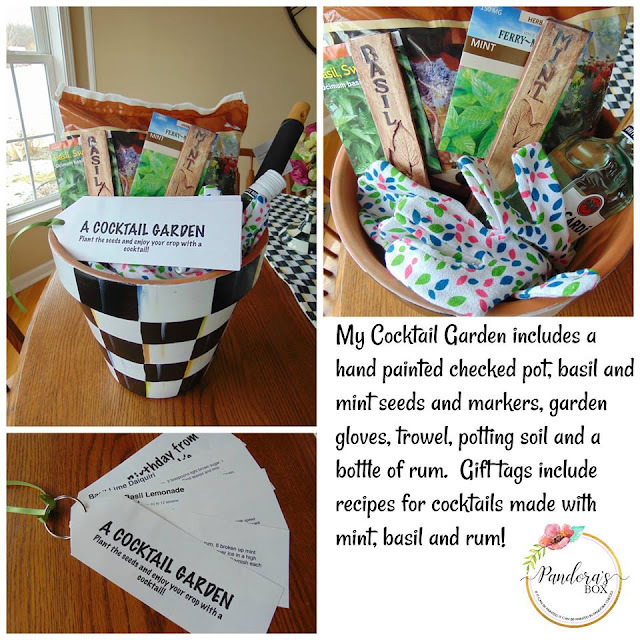 Your cocktail garden pot is beyond brilliant, how creative and wonderful!! Fun idea! I like to hand deliver little treats to friends for spring, and this is a great idea. It can be filled with just about anything that friend might enjoy. Thanks! 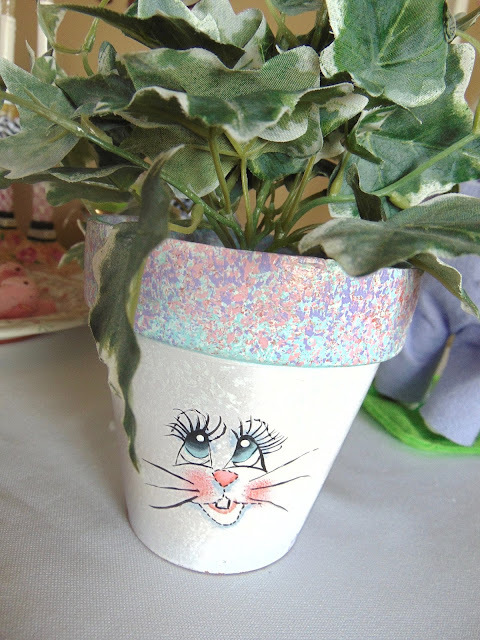 Awww, Patti, your rabbit pot has the cutest face!!! Great idea to reuse an old pot or to dress up a new for every holiday season! I love the sponging, too. I need to get busy crafting; it has been too long. Thanks for sharing for 10 on the 10th. Happy to be with you on this tour. Patti, this is a super cute idea. I’m so impressed that you can draw a bunny face. 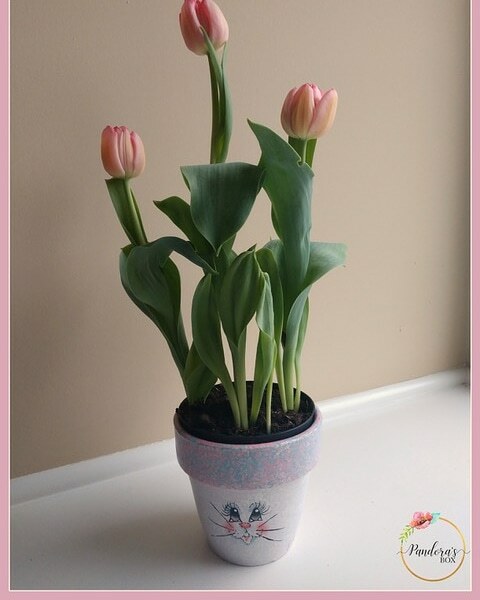 Great way to use clay pots for Easter.